"Agana" redirects here. For other uses, see Agana (disambiguation). Hagåtña (/həˈɡɑːtnjə/; Chamorro pronunciation: [hæˈɡɑtɲæ], formerly in English: Agana /əˈɡɑːnjə/ and in Spanish: Agaña) is the capital village of the United States territory of Guam. From the 18th through mid-20th century, it was Guam's population center, but today it is the second smallest of the island's 19 villages in both area and population. However, it remains one of the island's major commercial districts in addition to being the seat of government. "Hagåt" (also romanized as haga', with a glottal stop instead of a syllable-final "t") means "blood" in the Chamorro language. The suffix "-ña" can be translated as either the possessive pronouns his, hers or its in English (cognate to -nya in Malay), or a signification of greater comparative degree, similar to some uses of the English suffix "-er". There is much speculation that the natives originally migrated from the village of Agat/Hagåt. Therefore, "Hagåtña" can be translated "his or her blood" possibly meaning "related to him, her or it", or it could be translated to what might roughly mean "more Hagåt", as in, an extension of the village of Hagåt. It could also mean "better Hagåt", or "more than, surpassing or superior to Hagåt" in a sense of being "more Hagåt than Hagåt itself". In 1998, the Guam Legislature changed the name from "Agana" back to the original Chamorro/Chamoru form. However, the name of the neighboring village Agana Heights remains unchanged. Hagåtña is located at the mouth of the Hagåtña River on Guam's west coast. According to the United States Census Bureau, the city has a total area of 1 square mile (2.6 km²). The village is bounded by the sandy beaches of Agana Bay to the north, the Agana River and associated wetlands to the east, and a cliff (above which is the village of Agana Heights) to the South. Several high-rise office buildings are in the center of the village, while the western portion of the city known as Anigua is more residential. Unlike many villages, central Hagåtña is divided into city blocks with shops and small restaurants throughout the center of the village. Highly populated residential areas in the villages of Mongmong-Toto-Maite, Sinajana, and Agana Heights surround Hagåtña. Main street of Agana, around 1899-1900. Street view of Agana, around 1899-1900. Photo of Agana taken before World War II. Hagåtña was a prominent village before Guam's colonization by the Spanish. In 1668, the first Spanish missionary, Padre San Vitores arrived on the island. The family of Chief Kepuha donated land in Hagåtña enabling San Vitores to build the first church (Dulce Nombre de Maria Cathedral-Basilica) on Guam. Under Spanish rule, much of the indigenous population of Guam and other Mariana Islands was forced to relocate to the city. The remains of buildings from the Spanish administration can be seen in the Plaza de España located beside the cathedral of the Archdiocese of Agana. The remains of the Spanish Governor's Palace is here and is closer to the Department of Education than the Cathedral. Village of Caroline Islands immigrants near Agana, 1899–1900. After Guam was ceded by Spain to the United States in the Spanish–American War of 1898, 'Agana' remained the seat of government under U.S. Naval Administration. By 1940, the city's population had grown to about 10,000 containing nearly half of the island's residents. Villages had been established nearby for immigrants from the Caroline Islands. Guam was captured by Japanese forces on December 8, 1941. It was an insult to the Guamanians when their new landlords, the Japanese, renamed Guam Ōmiya-jima (ja. : 大宮島) or Great Shrine Island, and Agana Akashi (ja. : 明石) or Red or Bright Stone. Relations with the Japanese went downhill, but life for the easygoing 20,000 Guamanians still was tolerable. During Guam's 1944 liberation from the Japanese during World War II, the city was heavily damaged by U.S. naval bombardment. Many former residents settled in other parts of Guam after the war. As part of Guam's reconstruction plan, the U.S. Navy constructed new straight city streets that passed through existing lots and created many plots of land with multiple owners. This has hindered the development of the city to the present day. In December 1944 Guam was the scene of the Agana race riot, between black and white servicemen stationed on the island. Today, despite a resident population of only 1,100 (less than 1% of Guam's total), the city remains the seat of the territorial government. Its historic sites are major attractions for visitors. Hagåtña is served by Antonio B. Won Pat International Airport in Tamuning and Barrigada. Dulce Nombre de Maria Cathedral Basilica in Hagåtña, faced by a statue of Pope John Paul II. As Guam's historic population and administrative center, many traditional celebrations take place in Hagåtña. On December 8, Santa Marian Kamalen, Patroness of the Mariana Islands, is honored by a procession where a statue of the patroness is pulled on a cart amid the prayers of thousands of the island's Catholics . Guam's most celebrated patriotic holiday, Liberation Day is on July 21. The annual Liberation Day Parade takes place on Marine Corps Drive in Hagåtña. In addition to the historic sites at the Plaza de España and the Basilica, Latte Stone Park and the Chamorro Village shopping area offer further information about the island's history and culture. The Taipei Economic and Cultural Office, of the Republic of China (Taiwan), is in Suite 505 of the Bank of Guam Building. The island's capital, the legislature, the governor's office and other government offices are in Hagåtña. The Government House (Chamorro: Guma I Taotao Guam), traditionally the governor's official residence, is situated above the cliff but technically within the city limit of Hagåtña. Adelup, home of the Ricardo J. Bordallo Governor’s Complex since 1990, was once part of Asan-Maina before being annexed into Hagåtña so that Hagåtña remains the seat of the Government of Guam. Adelup is used as a metonym in reference to Guam's government. The Guam Department of Corrections operates the Hagåtña Detention Facility in Hagåtña. Notable federal government agencies in Hagåtña include the District Court of Guam at 520 West Soledad Avenue, the United States Attorney at Sirena Plaza, 108 Hernan Cortez, Suite 500, and the United States Postal Service Post Office at 223 West Chalan Santo Papa. 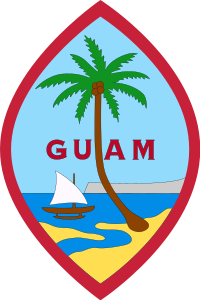 The Guam Department of Education serves the entire island of Guam. Guam Public Library System operates the Nieves M. Flores Memorial Library at 254 Martyr Street in Hagåtña. Venancio Roberto, two-day Governor of Guam. Jason Cunliffe, Guam international footballer. Kimberley Santos, Miss World 1980 (succeeded). ^ "Hagåtña". Dictionary.com Unabridged. Random House. Retrieved August 11, 2017. ^ "» Hagåtña". www.guampedia.com. Retrieved 31 March 2018. ^ "Contact Us." Taipei Economic and Cultural Office Los Angeles. Retrieved on February 4, 2009. ^ "Prison Security." Guam Department of Corrections. Retrieved on May 19, 2010. ^ "District Court of Guam." ^ "United States Attorneys Offices Contact Information." ^ "Post Office Location - HAGATNA." United States Postal Service. Retrieved on December 4, 2008. ^ "筋トレ豆知識 - 筋トレ豆知識". archive.org. 22 February 2006. Retrieved 31 March 2018. ^ Leon-Guerrero, Jillette (9 August 2010). "Guam Leaders from 1899-1904". Guampedia. Guam: University of Guam. Archived from the original on 20 October 2010. Retrieved 21 October 2010. Wikivoyage has a travel guide for Hagåtña. Wikimedia Commons has media related to Hagåtña.